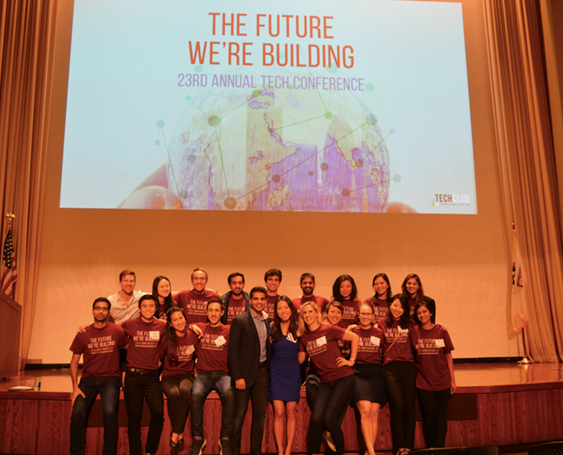 The 23rd annual Tech Conference took place on September 16th, 2017 at Harvard Business School (HBS) and we had over 1,200 students, professionals, and professors. The goal of this year’s conference was to continue our tradition of bringing industry leaders to HBS not only whose past stories would inspire and educate the HBS community, but who are leading organizations that will likely dominate the next decade in technology. Our group of 70 speakers (largest ever) included Corporate Executives (CXOs), founders, and senior executives from big tech companies, start-ups, and venture capital (VC) funds. The unifying theme of this year’s conference was ‘The Future We’re Building’. At the baseline, we wanted to discuss emerging technologies and trends such as blockchain, augmented reality/virtual reality, cryptocurrency, autonomous vehicles, and artificial intelligence machine learning. However, we did not want to just stop there. We took our discussions and conversations a step further to talk about the responsibilities that we have as current and future leaders to make the technology community more inclusive and diverse. The morning kicked off with an engaging keynote discussion with Carolyn Everson, Vice President of Global Marketing Solutions at Facebook. The highlight of this session was when Carolyn shared a story about how one day she received a fax from Pets.com, a company she had founded, that said that she was fired. Not only did this incident shatter her dream, but it rocked her confidence for several years. A few years later, Sheryl Sandberg, who recruited Carolyn to Facebook, pointed out that she had noticed some confidence issues with Carolyn. Carolyn mentioned that it was because she was fired from her own company. Sheryl then told her - “You’ll be fine! You were fine then, and you’ll be fine now”. They key point Carolyn delivered here was - “Things are sometimes not going to go your way and you will get back on your feet. Don’t let anyone knock your confidence”. In today’s ever changing technology industry, we will face obstacles and failures, but the key is to learn and keep marching forward. Throughout the day, the conference had many different panels. 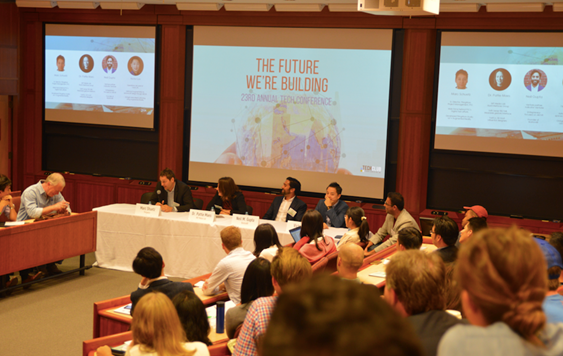 In order to expose the HBS community to trends in the technology space outside the U.S., the conference for the first time saw a panel titled Tech in the Developing World. Visitors included CXOs from tech giants Tencent (China) and Paytm (India) along with speakers active in Africa as well as Latin America, thus offering a true worldview of the technology and start-up landscape outside of the U.S. 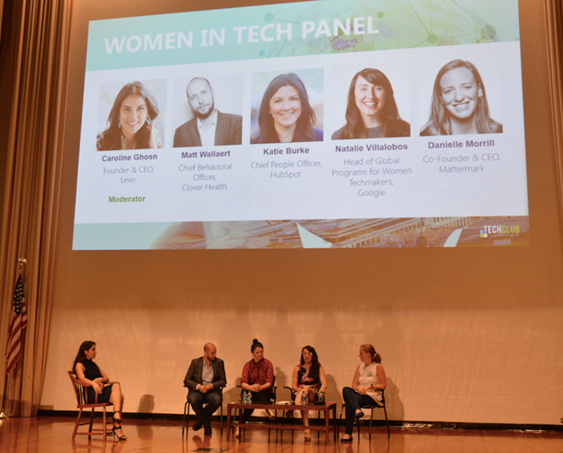 The panel was intended to fuel the deep seated, and often unrealized, desire of students to start their venture and take a plunge in the technology space in upcoming markets - often their home countries. Hearing stories from the visitors about the fantastic work underway in some of the markets, and the plethora of opportunities that lie ahead, participants were evidently inspired and excited about the prospects that they can explore outside of the U.S.
Next, we had a dual keynote session with Deep Nishar (Senior Managing Partner, SoftBank) and Eric Paley (Managing Partner, Founder Collective) who were interviewed by Dan Primack (Business Editor at Axios). Our goal here was to gather perspectives from early stage and late stage investors. Deep’s key point was about how exponential trends can be very powerful. Here, he spoke about how Moore’s law disrupted the semi-conductor industry, which went on to grow from $30 billion to $330 billion over a span of 40 years. Deep then highlighted how the trend of decreasing the cost of sequencing a human genome will be even more disruptive than Moore’s law. Right after Deep, Eric Paley spoke about his investment philosophy and how he thinks prorata (a right to invest in subsequent rounds to maintain their level of ownership) aligns with incentives of VC funds but hurts entrepreneurs. Eric’s discussion brought a whole new perspective: when a company is performing well and it attracts outside investors, pro rata rights of previous investors limit the amount of money new investors can invest, causing friction and creating problems for the entrepreneur. On the other hand, when investors with pro rata rights choose not to invest, it sends a negative signal, again hurting the entrepreneur. After lunch, we had our highly anticipated session with Frances Frei (Senior Vice President Leadership & Strategy, Uber) and Bozoma Saint John (Chief Brand Officer, Uber). Both of them shed light on their current responsibilities and what they are doing to turnaround the culture at Uber. The highlight of this session was when Frances and Boz spoke about how they are not just focused on crafting and communicating a clear, consistent, and coherent strategy across all employees, but also on closing the achievement and satisfaction gaps amongst diverse groups. A quote that stood out was - “Diversity in the absence of inclusion is a very false sense of progress”. We are extremely grateful to our organizing team and the speakers who took the time to travel to Boston and share valuable insights from their past and current experiences. Partner with the Tech Club directly or connect with over 50 career-related student clubs.